AXA's SL7 and SL9 locks were a very solid design and fitted to many Dutch bicycles between 1992 and 2007. Unfortunately, it was then discovered that while the locks were otherwise very solid, they could be opened using a technique with a blank key. For this reason, the SL7 and SL9 locks are no longer considered to be safe and have been replaced by the AXA Defender, a new design of lock which does not share the same weakness. This cable is only available in grey, as shown in the photo. WARNING - this cable can only be used with the AXA SL series locks. It does not work with the AXA Defender lock. We still get a lot of requests for plug-in cables or chains to fit the SL7 and SL9. This cable is the only plug in option still available for those locks. However, we recommend that customers instead replace their existing lock with an AXA Defender lock and then use one of the many cables and chains available to fit the AXA Defender lock to fit to the new lock. 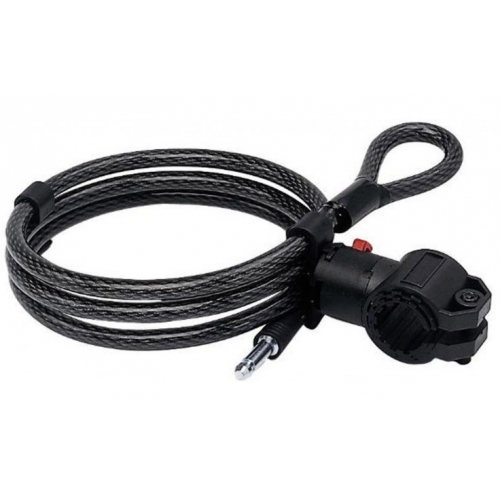 Note that the size of the plug in pin on the Defender is not the same as that on the SL7/9 and therefore this cable will not work with other locks such as an AXA Defender. Note that we do not accept returns on this part. Please only buy it if you really need it, and our recommendation remains that you buy an AXA Defender and accompanying chain for that lock instead of buying this.